I'm surprised that I haven't heard of this one before as it sounds like a really promising read that I would totally enjoy! I've read a couple books lately where the inclusion of a love triangle was actually a positive thing rather than the typical negative, glad this triangle seemed to be the same way for you Keertana! Sounds like a really strong, character driven story, and I so love those:) Gorgeous review! The Civil War and post era is not my favorite historical era to read about, but my goal this year is to push out of my comfort zones. Verity sounds like a character I would love to read about, watching her find her definition of love and if she finds it. What a well thought out review! I need to find out more about caged graves, I've never heard of them. The implications are in your review, but I still need to know more. Off to put it on my TBR! @Rachel: I was pleasantly surprised that the love triangle in this book wasn't a contrived or forced device too, Rachel. I do know a handful of readers who weren't a fan of this book - thus the negative review you probably read - but I really enjoyed it. I'll be interested to see what your take on it is, though - I hope you like it! @Melissa (i swim for oceans): Melissa, this is RIGHT up your alley. Seriously, I know you love your historical fiction and I'm sure you'd absolutely love this one. I hope you read it soon so we can discuss and compare thoughts! 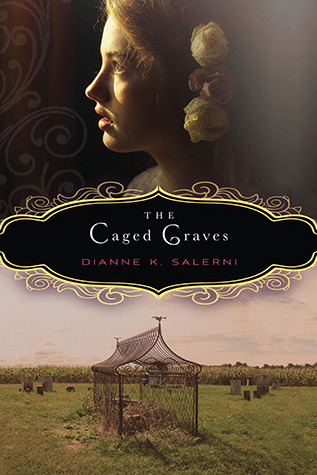 @Heather: I did some more research on caged graves myself and even before this time period, they were used to prevent the dead from rising up from their graves as the folks during the Victorian Era (I think...!) were superstitious that the dead could rise. It's quite chilling, but the context in this novel is rather different. You'll have to let me know if you find out anything else about these graves, though. Oh MY. I was already so excited for this book, and clearly I must move it up the TBR list IMMEDIATELY! 4.5 stars from you is precious, and with a premise that is so right up my alley, it sounds like this is a sure thing for me. Oooo. Oh, Keertana, I've been wanting to read this one since the first reviews started getting published. It sounds like it contains everything I love about historical fiction and then some! What you wrote regarding the love triangle is also really interesting. I've never really thought about them from that angle (probably because most authors don't actually do that), but it makes sense and definitely sounds bearable. Revolutionary war history, mystery, buried treasure, a heroine whose voice shines out to you, all of these peak my interest big time. However, as much as you understood and enjoyed the love triangle, and as much as I can see that this is one that makes sense for this story, I am really struggling with triangles right now and am hesitant to start any story that features one. I'm also not sure I've EVER read a romance where I've felt like I couldn't choose either guy and would be happy with both. But the heroine must handle this respectfully if you speak so highly of it, so I'm hoping that she doesn't spend the whole book dithering. I will definitely put this on my radar for when I'm feeling less fragile about romances! Lovely review. The author has done a bang up job on this book. You will find high anxiety, greed, action, mystery, romance and redemption all through this book. What a creative imagination this author has put to work in her writing. I hope to be reading more of her books soon.